I used my Iphone for the screen, which allowed me to simulate the in-game interface by playing videos – animated scanlines and background humming noise added to the authenticity. The screen was flat – unlike the slightly-rounded CRT of the in-game model… plus the prop was about 20% bigger than the “real” Pip-Boy, because I’d scaled the model to fit the phone. Oh well, nothing I could do about that – even if I could find a super-thin CRT, I don’t think that’d fit into my limited budget, and I wouldn’t want to strap it too my arm! 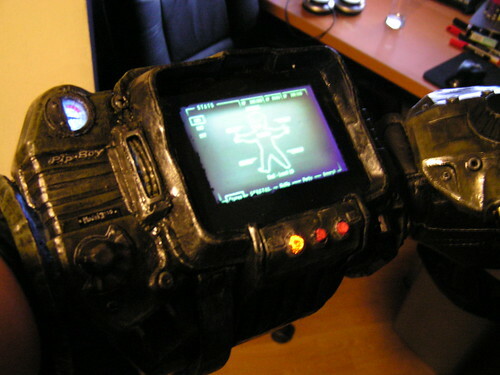 Flash forward a few years… I saw a link to Zachariah Perry’s Pip-Boy build, showing off a cleverly-faked curved screen – ahah, very clever! His version, based on a cast of the official Limited Edition alarm-clock, has a screen taken from a digital photo-frame, seen through a rectangular lens taken from an old slide-viewer. But this time I’d do it to a more accurate scale, and build it around a nice fake-CRT screen. Since I still expected to wait a while until the printer was ready, I would concentrate on working on the internals first, in order to work out exactly how much I needed to fit inside. I now had experience with the Raspberry Pi and Teensy boards, and had seen pictures of Ryan Grieve’s Raspberry Pipboy build, so I thought I might as well make this a fully-working prop too! Ok, that’s where I started out, many months ago – now I can get onto writing some more detailed and (hopefully) useful posts: I’ve learned a lot about electronics and stuff while working on this project, and hope to share some of the tips and tricks I’ve picked up along the way!